CRJ LETTINGS in Chichester. Leave us a review. CRJ Lettings strives to provide excellent service to everyone we come into contact with; whether you're a landlord, tenant, Chichester Property News reader or simply looking for some advice. If we're successful in doing this, we believe the business can grow organically by word of mouth, rather than passing on large marketing costs to our landlords and tenants. This is why your feedback and recommendations are so important for the sustainability of our business model. Thank you for your custom and a special thanks to all those who have recommended our services to others. In an increasingly 'online' world, if you are able to leave an online review of the service you have received, we would be extremely grateful. Better yet, 'copy and paste' your review over several websites to give us more exposure! If you feel our service has fallen short of a 5* rating, please contact us before leaving a review so I can understand your concerns. "Google is the biggest player online, so a positive review here helps boost us towards the top of the search results"
Clicking the Google logo not working? Click here for help. 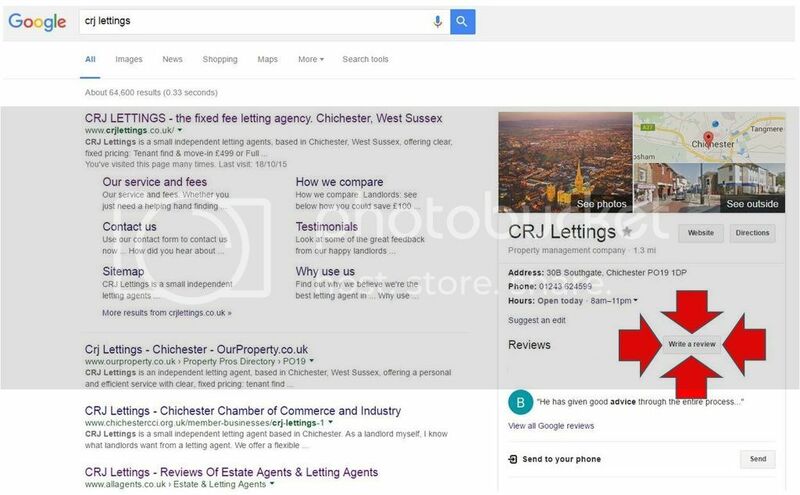 If you search 'CRJ Lettings' in Google, you'll see there is a button on the right-hand side of the page that allows you to 'write a review'. "allAgents is the UK's largest customer review website for the property industry"
"raterAgent is a trustworthy, dedicated estate and letting agent review site for getting proof of the quality of an agent's service"
"Yell helps you find the right business for your needs"
"FreeIndex is the UK's best loved business directory"
"Yelp helps connect people with great local businesses"